I know, I know! 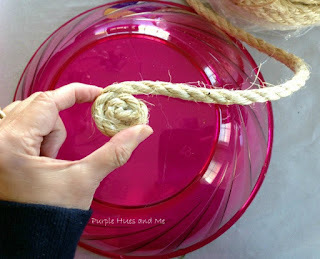 There are lots of tutorials on making rope baskets but have you seen one that includes a lid? Who doesn't love a handcrafted and adorable catchall that has a top to hide it all? And the best part - it's so easy to make including adding decorative rope accents! Begin by dipping the end of the rope in mod podge to prevent fraying and let dry. Once dry, coil end tightly in circle, securing with a dab of hot glue and place on a upside down bowl bottom you'll be using to shape the basket. Add lines of hot glue along the rope as you are coiling it around the bowl base, making sure to keep the rope even and the circle flat. An afterthought was to add *plastic wrap around the bowl since a lot of the glue seeped through. But next time, I'll use parchment paper for a much easier removal and clean-up. Continue coiling and gluing the rope around the bowl, holding the rope firmly in place as you are waiting for the glue to dry (a few seconds) until reaching the desired height. Remove the basket from the bowl by gently pulling off the plastic wrap from the bowl and twisting it out. *Use the clean tip of the hot glue gun to remove any excess glue and remaining *plastic wrap that's stuck. Turn the bowl upside down and continue gluing a "lip" on the bowl (to hold lid), circling around twice. Leave about 12 inches of sisal rope on the finished basket and cut off excess. Make a decorative coil on the outside of the basket and hot glue in place. To make the lid, use the rest of the sisal rope from the original roll and place the end in mod podge, as before, to seal. After drying, make a small loop and hot glue together. Hold the loop upright and begin coiling the rope around the loop. Continue coiling in a flat circle pattern, adding glue around the rope. As a guide to how large to make the lid, I drew around the opening of the basket on parchment paper . . .
and continued coiling and gluing on the parchment paper until covering the circle pattern. Leave several inches of excess rope and make a matching decorative coil on top. Glue in place. And finally, give the basket of coat of mod podge or sealant to control sisal threads and dust particles. Perfect for any area where a bit of pizazz and order is needed! What a cute basket, Gail. It reminds me of baskets sold in South America! WOW!! I can't wait to give this a try. Thanks for sharing your brilliant idea. I hope mine looks as nice as yours. I love it, Gail! Once again, you have blown me away with your creativity. Hugs to you! Amazing- you never cease to impress me! This is cute and a great accent piece! So creative and cute. Who would of thought to make your own basket. Where do you get these ideas? They are endless and unique. OMG Gail, I love what you did with this!! I have lots of ugly plastic containers, I could do something similar! Thanks for the inspiration!! Pinning to remember! 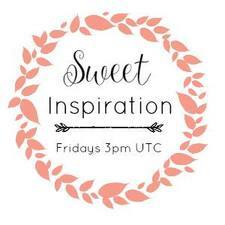 By the way, thank you so much for linking up with us at #sweetinspiration, hope to see you again next week! I have sewn a coiled basket but never used glue before. I think I might be able to make a few of these. They would make great gift holders. wow so awesome and I am so making one of these sisal rope baskets! Gail, I love crafting with sisal rope and such a cool idea to make the basket and lid. Love the swirling finishing touches! Pinned and tweeted to share! Love your sisal basket, Gail. I'm featuring it this weekend at the DIY Sunday Showcase Party! Great job Gail, it looks wonderful. Thanks so much for joining the Dishing It & Digging It Link Party also. Hope it brings you some new friends and great traffic! Nicely done. I liked the way you have made the last coil on the bowl. This way the end of the rope is hidden. This is such a great project idea, Gail! Your basket is so pretty! Thanks for sharing at Snickerdoodle Sunday. Also, I always love that you give such detailed tutorials for your projects! I'll be featuring your sisal rope basket at this week's Snickerdoodle Sunday Party. Hope to see you there! You seem to be just the "go to" person I need to ask this question that I have regarding coiling rope, etc. around an item. Is there any way to avoid the overlapping area as the rope progresses around the bowl? It seems there was just one glimpse of the "back" of the basket where this happened, but would love to see a photo of the back side once completed. I covered a lamp in braided sisal and it definitely has a "back side". Thanks for any ideas or help you may have. It could be this is the only way to do this and is inevitable that you will have this cross over area. I LOVE your idea and can't wait to get started-but only after I finish my other 10 things I have begun! Ugh! A crafter's life is never easy LOL. Congratulations! This post is going to be featured over at Diana Rambles tomorrow and has been pinned in the Featured at Diana Rambles board at Pinterest and Tweeted. Please grab a featured button off my button page or via the post guidelines graphic. Thanks for sharing this awesome idea!